House of Fraser is a British chain of department stores, originating in Scotland in the 1850s. It eventually became a popular high street brand. Unfortunately, House of Fraser began closing stores and then went into administration in 2018. Following an acquisition by the owner of Sports Direct, it began trading normally again a month later. There have been some problems, however, with online orders and gift cards. 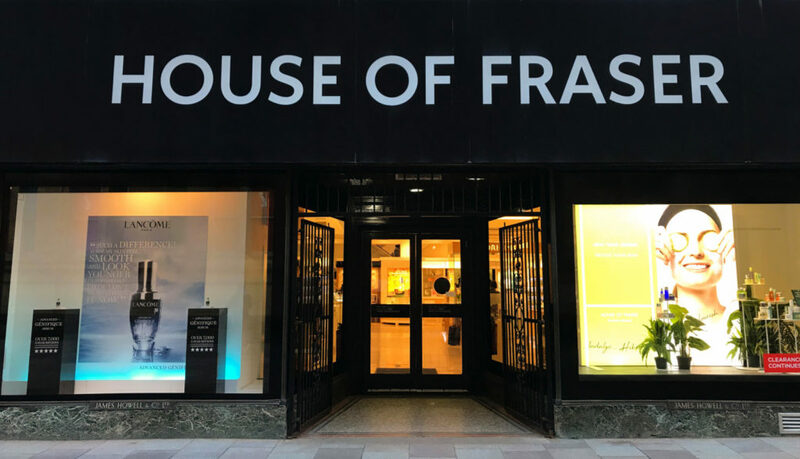 Read this guide on the up-to-date House of Fraser returns policy if you need to know how to make a return. This will depend on what you have bought and how. You must return items to House of Fraser within 28 days of receipt if you change your mind. You cannot cancel a House of Fraser order after placing it except by returning the items for a refund. The House of Fraser returns policy states that they will only accept goods in their original condition and packaging, with all tags and unbroken seals still on. Otherwise, they can refuse the refund and send the items back to you at your own expense. You will not be able to return certain items at all. These include pierced jewellery, made-to-order products, and perishable goods. To return something that you bought from a House of Fraser store, simply take it back to a store. You will need to provide the receipt as proof of the sale. For online orders, you must return them by post at your own cost. If you do not have a returns form to include in the parcel, then you can print one off and fill it in yourself. If you inform them that you are returning your order, then you must send it back within 14 days. You should use a trackable service and keep the postage receipt. Whichever postal service you choose will be at your own risk and expense. The House of Fraser returns address is Customer Returns, Unit B, Brook Park East, Shirebrook, NG20 8RY. If an item is too large to return by post, contact House of Fraser to arrange collection. This will also be at your own expense. They will notify you by e-mail when they receive your return and issue your refund. They will only pay for returns if an order is faulty. If an item develops a fault more than 28 days after purchasing it, then you will need to contact customer services. Otherwise, follow the regular returns process. You should specify on the returns form that the item arrived with the damage or fault. When returning something faulty or incorrect, you have three options. You can request a repair, a replacement item, or a refund. You can only ask for a repair or replacement if something becomes faulty after one month. They may grant a price reduction if you keep the defective item, or a partial refund if you return it after use. Exchanges are not possible when you return online orders to House of Fraser by post. If you want to exchange an item, you must take it to a House of Fraser store within 28 days. The exchange is subject to stock availability at the store of the item in the size or colour that you require. If the stock is not available, then they will offer a refund onto a gift card. To get a refund to the original payment method, you should return the item. Non-returnable items in the returns policy are also not valid for exchanges. They may only allow an exchange if the item is faulty and unusable. House of Fraser should credit a refund to your payment method within 14 days of receiving your return. They will only refund the delivery charge as well if you are cancelling the entire order. This does not apply for the premium delivery options or if you only return part of an order. You should receive a full refund of the value that you paid for the items if they meet the return conditions. House of Fraser might reduce your refund to reflect a loss in value if you mishandle the products. If you return by post, then they should send you a confirmation e-mail within a week confirming your return and refund. When you pay partially by gift card, they will issue an e-voucher for the amount.